The cases of rebirth listed in this article occurred between Hindus and Muslims in India. In eight of these cases a Muslim child is said to have recalled the life of a Muslim. In seven cases a Muslim child is said to have recalled a life as a Hindu, and in 11 cases a Hindu child is said to have recalled the life of a Muslim. Of the 26 cases, 5 of the subjects were female. Not surprisingly, Antonia encountered considerable apprehension, resistance and even hostility while crossing the religious boundaries existing between the families of the subjects. These results have been published in her two-part paper “Moslem Cases of the Reincarnation Type in Northern India” [1, 2]. What follows are some interesting anecdotes from her papers. My daughter Pirbin died at the age of five. One year after her death the daughter of Mohammed Madari Khan of this village gave birth to a girl child. When the girl was five years old, I chanced one day to go on some business to the house in which she was living. She recognized me and called me “Father.” I brought her to my house with me and she recognized my wife as her mother and my two sons are her brothers. She also knew my parents, grandparents, two brothers, and near relatives of this village; namely, Mordan Khan, Pir Khan, Alisher Khan, Sahib Khan, Tej Khan, etc. She even told which things of the house she had used as her own. She is now with her husband, Mohammed Khandan Khan in Sarolly Village of [District] Bareiily. Antonia Mills then lists various cases that she herself investigated and whose records exist at the Division of Perceptual Studies at the University of Virginia. Umar Khan refused to eat meat, saying he was Hindu. Mohammed Hanif Khan initially refused to eat fish (the previous personality did not eat fish). He wanted a Rakhi thread tied on him when he observed the practice of this Hindu ceremony which celebrates the brother-sister bond. Noor Bano refused to eat meat; in fact, Noor’s mother indulged her in her vegetarian desires, although her father had been unaware that his wife cooked food for her separately. Nasruddin Shah refused to eat beef or fish, although he would eat mutton. He resisted the Muslim religion and would not say Muslim prayers or go to the mosque. Mukul Bhauser was observed bowing to perform namaz (traditional Muslim prayer) even before he could speak. Kailash Narain Mishra also performed namaz. He wanted meat and special dishes for Muslim festivals, about which he used to talk. Archana Shastri when two and a half years old was observed to say namaz for her father’s health when he was ill. Thereafter, and for some time, she practiced namaz at 5:00 a.m. and 9:00 p.m.
Hirdesh K. Saxena said namaz until he was five years old, and he wanted to go to Muslim services. Giriraj Soni began to practice namaz before his parents suspected he might be having memories of a previous life. He was continuing to do so up to the age of seven and a half; he was also attending the services at the local mosque each Friday. He asked for mutton and eggs although his parents were vegetarian. Subhash Singhal practiced namaz when about three years old, and felt very attracted to ladies wearing the black outer covering worn by Muslim women in public in India. Even when he was thirty-five years old, he would continue to go to a Muslim shrine to pray whenever he was troubled or wanted special divine assistance. He had introduced his wife to this shrine, but had never mentioned to his father that he was following this non-Hindu custom, suspecting parental disapproval. He asked for Muslim food on a Muslim holiday. The paper provides extensive information on the case of Naresh Kumar Raydas (henceforth called Naresh) who was born in Baj Nagar about April 1981. When Naresh first started speaking, at the age of about two years, he often said, “Kakori, Kakori” and also “karka, karka,” which means “horse-cart” in the local dialect. From the time Naresh was about two years old, he was sometimes observed kneeling down at home as if to perform namaz, the Muslim form of ritual prayer. By August 1987, when Naresh was about six years old, he repeatedly began claiming that he was a Muslim and from Kakori. He asked a Muslim Fakir who used to visit their house, “Don’t you recognize me? In my house there are five neem trees. I was hit by a tractor.” He asked the Fakir to take him home with him, which the Fakir declined to do. The next morning Naresh persuaded his mother to take him to the Fakir’s house in Kakori. Naresh’s mother told the Fakir that on the way she had asked someone for directions to the Fakir’s house. Naresh responded with annoyance, saying, “You mean I don’t know? Come, I will show you.” Naresh’s mother told the Fakir that Naresh then led her to the Fakir’s house, which is in an area of Kakori where he and his mother had never been before. When they arrived, Naresh again called the Fakir “my Abba [Father].” Naresh called the Fakir’s wife Amma (Mother). It turns out that Naresh in his previous life had been Mushir Ali Shah (henceforth called Mushir), the eldest son of the Fakir Haider Ali Shah by his second wife. Mushir had lived with his parents in the town of Kakori. He was employed driving a horse-cart filled with fruit or vegetables from Kakori to the market at Lucknow. He was approximately twenty-five years old when, on June 30, 1980, a tractor struck him and his cart filled with mangos. Mushir died on the spot, which was on the road from Kakori to Lucknow where it passes about a half kilometer from the village of Baj Nagar. During the visit to his previous home, Naresh proceeded to recognize Mushir’s brothers and a sister present, as well as the sister’s husband, whom he called by name, Mohammed Islam. Naresh then pointed out one of five metal suitcases inside the house, said it was his, and asked for the key. He described the contents before opening it, saying (according to the Fakir) that there were three rupees and his cap in the trunk, When he opened it, these items were inside. The Fakir and his wife said that they had not known there were three rupees inside Mushir’s trunk. Naresh then asked the Fakir’s wife, Najima, “Where is my younger brother, Nasim?” She said he was sleeping. Naresh went to him and hugged him and started kissing him. Najima then asked Naresh how many brothers and sisters he had. Naresh said that he had five brothers and six sisters and that one of the sisters was a stepsister. This was correct for the time Mushir was alive. Najima, pointing to Sabiah, a girl about six years old, then asked him who she was. Naresh said, “She was in your stomach at that time.” This youngest child of the Fakir’s was born three months after the death of Mushir. Naresh recognized a number of people from Kakori who had gathered at the Fakir’s house on Naresh’s first visit. One of these was the wife of a man called Zaheed, and he is said to have asked her, “Have you not given my 300 rupees to my Abba?” In fact, three days after Mushir’s death Zaheed had given the Fakir the 300 rupees that Mushir had deposited with him. Naresh was asked if he recognized a particular old lady who arrived at the Fakir’s house. This lady told me that he had not. However, Mushir’s mother said that Naresh, out of this lady’s hearing, had said that she was “Shafique’s wife who lives near the mosque.” This was correct. When Naresh was going to be sent back home from the Fakir’s house with five rupees, he said, “What do you mean? That you will send me off without giving me tea and egg?” Mushir had been very fond of tea, eggs, and semia. Tea and eggs were foods that he had every day. Muslims do not traditionally believe in reincarnation but the Fakir changed his view after observing the boy. After Naresh approached him and said he was his son, the Fakir felt deeply troubled. Unable to sleep, at midnight he prayed, “Allah, what is this mystery?” Naresh’s remarks convinced the Fakir that Naresh was his son Mushir reborn. At first the Fakir’s wife was shocked that a young boy claimed to be her son. However, she too became convinced that Naresh was her son reborn. In recounting the events, the Fakir and his wife were moved to tears. The Fakir’s voice shook with emotion every time he recounted the incidents. Antonia Mills. Moslem Cases of the Reincarnation Type in Northern India: A Test of the Hypothesis of Imposed Identification Part I: Analysis of 26 Cases. Journal of Scientific Exploration, Vol. 4, No. 2, pp. 171 – 188, 1990. Antonia Mills. Moslem Cases of the Reincarnation Type in Northern India: A Test of the Hypothesis of Imposed Identification Part II: Reports of Three Cases. Journal of Scientific Exploration, Vol. 4, No. 2, pp. 189-202, 1990. K.C. Sahay. Reincarnation: Verified cases of rebirth after death. Bareilly: N. L. Gupta, 1927. According to Dr. Granville Dharmawardena of Colombo University reincarnation may be defined as the re-embodiment of an immaterial part of a person after a short or a long interval after death, in a new body whence it proceeds to lead a new life in the new body more or less unconscious of its past existences, but containing within itself the “essence” of the results of its past lives, which experience goes to make up its new character or personality. In the seventeenth century Rene Descartes divided everything in the universe into two realms as “Res Extensa” (matter) and “Res Cogitans” (mind). Gathering knowledge within the realm of Res Extensa was called Science and the phenomenon of reincarnation got pushed into the other realm Res Cogitans which was not considered suitable for scientific probing. Science developed in the framework of Res Estensa is known as “Classical Science”. Classical science had tremendous material achievements because it helped all round growth of technology which brought about prosperity to mankind. The air of frame work of Classical Science was blown out by Henry Becquerel in 1896 by the discovery of Radioactivity. The discovery of Theory of Relativity by Albert Einstein in early 20th Century gave it further blow. The advent of Quantum Theory and the Uncertainty Principle did the rest. It is significant to note that Einstein’s discovery fall entirely within the frame work of Res Cogitans as it did not involve any experiments or measurements. Gravitation Force Theory of Newton is also an example of such observation and intuition work involving no experiments and measurements. Modern Science enhanced man’s knowledge surpassing the restrictions imposed by the five senses and took us to hidden areas of nature and profound changes had been introduced in procedures of science. Our ability to understand everything by way of perceptible mental pictures is reduced and it became necessary to imagine models with components which behaved in ways that had no counterparts at all in the world familiar to us. In most cases mechanisms involved in these models not only are imperceptible but also consist of elements that operate in ways never known in the world that we actually experience through sensory inputs. Sakina Yusuf Khan writes in an article A Night Of Forgiveness published in The Speaking Tree: “It (Shab-e-Barat) is also a festival associated with the dead. It is believed that the souls of the dead are set free on this night to visit their relatives.” What this indicates? This is a belief in reincarnation, of course in subtle body. Sadia Dehlvi also writes in her article Jesus In Islam published in The Speaking Tree (August 29, 2010) that both Islam and Christianity believe that Christ will return to destroy the Antichrist. This is affirmation to reincarnation although in some restricted sense. It is clear from the above descriptions that both Islam and Christianity appear not to opposed to reincarnation. Of course, they don’t believe reincarnation in broader sense as Hindus do. Congratulation you have develop the higher theory of everything more wonderful than which has been developed by Stephen Hawking. Hopefully your some views for being considered for Unified Field Theory are recognized by International Science Community, hence I soon read the fundamental aspect proposed by you. I have posted my comments to the Blog of Syed K. Mirza on Evolutionary Science vs. Creation Theory, and Intellectual Hypocrisy. Syed Mirza seems to be a very liberal muslim. He responded to my comments as mentioned below. “Many thanks for your very high thought explanations of God. “Hence it can be assumed that the Current of Chaitanya (Consciousness) and Gravitational Wave are the two names of the same Supreme Essence (Seed) which has brought forth the entire creation. Hence it can be assumed that the source of current of consciousness and gravitational wave is the same i.e. God or ultimate creator. I have also discovered the mathematical expression for emotional quotient (E.Q.) and for spiritual quotient (S.Q.). Thanks for the detailed comment although I currently disagree with your contention given below that the Gravitational Force is the ultimate creator. I have written a paper entitled ‘Gravitation Force is the Ultimate Creator’ and presented it at the 1st International Conference on Revival of Traditional Yoga held in Lonavla Yoga Institute, Lonavla in January 2006. In this paper I have defined soul (individual consciousness), mind and body. According to this every point of action of Gravitational Force Field is individual consciousness or soul, electromagnetic force as the force of mind and weak and strong nuclear force as the gross material force which constitute physical frame of body. Hopefully, as science advances, your proposition will undergo thorough examination and get accorded its true worth. Thank you very much for your very nice response to my views on reincarnation. l was reading about some of Edgar Cayces’s past-life readings for some people he said were reincarnations of famous types. l noticed that some on these past lives were those said to be Mother and SA, so it looks like someone has got it badly wrong. l know you can have multiple emanations at the same time [contemporaneous] but l don’t think this is the likely answer here. Cayce lived between 1877-1945. Sri Aurobindo (1872-08-15)-(1950-12-05) (aged 78). Not many years between them. So, cayce was giving readings to people who were alive at the same time as SA and MOTHER. Just about every life claimed by SA and the Mother were also claimed by people who went to cayce for a reading!! Below is one of SA’s past lives as Augustus Caesar. As I said in an earlier comment, I don’t venture into such highly speculative discussions. 3) where they currently are and when they will return. With reference to a remark by the Mother “We have all met in previous lives”, a disciple asked Sri Aurobindo: Who precisely are “we”? Do both of you remember me? Did I often serve you for this work in the past? Yes, sandeep l understand your position, but l don’t think cayce is speculating and l was pointing to the flaws in his knowledge rather than whether SA and Mother were so and so in a previous life. l mean, the whole subject of ‘reincarnation’ is ‘Speculative’ isn’t it. l’m inclined to believe SA and Mother were who they said they were in past lives, so for me it’s not speculation and what l’m really indicating is the limitation in cayce’s method. l think people need to be aware that the so-called ‘Greatest Psychic of the century’ actually might not be. But, if your going to say everything is ‘speculative’ from now on, l’ll make this my last post. Thanks for all the information, l’ve learn’t a lot here. All I am saying is that I can’t get involved in it. It just creates too much confusion to dwell on issues which are beyond my measly occult powers. Yes. your right Sandeep. Re-incarnation is highly speculative and without something like yoga-dhrishti or whatever it’s called, or inner contact with the psychic being it’s always going to be IMO. l thought the research l found below, however, by a man called Brianstalin, might interest someone here. The Past-Life resemblances of these ppl is downright uncanny. He says he was trained by the Dalai Lama and other tibetan teaches in accessing the Akashic Records. Be that as it may, his research has thrown up some amazing stuff. l know SA definitely looked like his past incarnations – Leonardo and Augustus, so this seems to make sense – that we tend to repeat the way we look in previous lives. Knowing my past lives has never really been important to me but this did pique my interest. Sorry the author is Anurag Banerjee, but GV Wrekham has added something too. This article on past incarnations reminds me of another point I need to add to the “Practising Yoga without a Guru” article, which is that after the passing of a Guru, people spend inordinate amounts of time in reminiscing who they actually were, how great they were and all the work they did. The Guru says “live in the present” but people get stuck in that past moment, recalling adoringly how he said those words and what happened after that. This is nostalgia. We ought to be studying ourselves (becoming more self-aware) rather than obsessively studying Sri Aurobindo and the Mother. “people get stuck in that past moment” Yes, so true! Thanks. How precisely you expressed it Sandeep! I have also noticed that some of us have the habit of comparing our actions/circumstances with those of Masters (ofcourse to find answers), but how can two lives be so easily compared? That is why SA&M emphasised so much on experiences, which are unique for everyone i guess. The same phenomenon was observed after the passing of the Buddha. It was then that the Jataka tales, which narrate the past incarnations of the Buddha (mouse, deer, elephant, outcast and what not), were born. This was also the time when the Dharmakaya doctrine, which states that the Buddha pre-existed in a perfected state even before his birth, began circulating. The Goddess Tara was also added to Buddhism, probably inherited from the Shaktas. It is doubtful if the Buddha, who was himself silent on abstruse metaphysical topics, was responsible for these accretions. It was the arrival of Nagarjuna (the second Buddha), who laid stress on the Madhyamaka doctrine, that cleared the air. l’ll just put some info about what he says about this previous incarnation [paul mounet]. “Paul Mounet was a French actor and the brother of Jean-Sully Mounet. 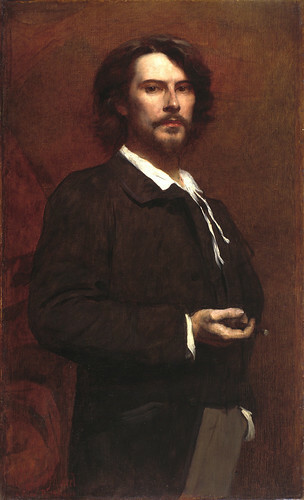 He became a doctor of medicine, and first appeared on the stage in Horace at the Paris Odéon (1880). It was in 1889 that he first played at the Comédie Française, of which he became sociétaire two years later. Mounet gained his reputation in Les Erynnyes, L’Arlésienne, Othello, Patrie, Hamlet, La Furie, Anthony, Le Roi, L’Enigme, Le Dédale, and Œdipe Roi. He served also as a professor at the Paris Conservatoire and became Chevalier of the Legion of Honor. 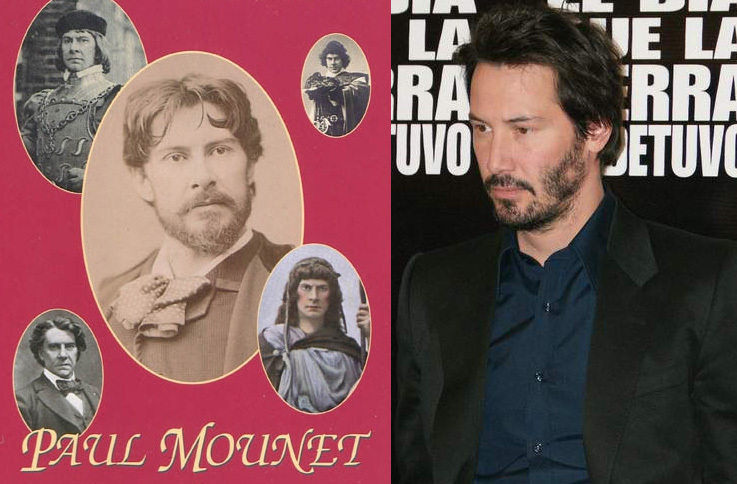 Some people (displaying greater psychic intuition than the false, self-proclaimed and cheating media psychic experts on reincarnation) have been intrigued by the striking resemblance between Paul Mounet and Keanu Reeves. This match is actually confirmed by the Akashic Records! Mike, there are several websites: another on this (which to my instinct (?) ) seems to be more relevant, is http://www.iisis.net. But this site also has some serious flaws as far as I can see. Yes, 1adt1, that site you gave is mostly to do with new-age channeling, l believe, which l find a highly dubious and dangerous practice. On that site they mention two past-life practicioners – Ryerson and Semkiw – these two ppl are denounced by Brianstalin [where l got the pics of keannu reeves from] as quoted below. l’m not absolutely sure about brianstalin but l tend to agree with a lot that he says and l believe SA and Mother have said similar things. “…The fact that I do not agree with Dr Semkiw or with Ahtun Re – the entity that speaks through Kevin Ryerson (Ryerson confirms all of Dr Semkiw’s matches) is not much of a surprise. Boy: Stop the damn vehicle..! Man: Who the hell is this…? Yes, amusing lol. One of the strangest advert l’ve seen. It may not be immediately clear, but advertisement is for Greenply furniture which is supposed to last across lifetimes. Hence, they introduced reincarnation to sell the product. Btw, if you hit the “Reply” button below a comment, your comment will get nested instead of appearing below it. Didn’t realise about the ‘reply’ button – thanks. I am one the chief expounder and supporter of Gravitation Force Theory of God. This is most scientific and secular theory of God. This is the Theory of Universal Religion. I have given Higher Theory of Everything. I hope you realize that people who propound such outlandish theories are more likely to be labeled as crackpots. Your theory is unlikely to be accepted by anyone other than a few stray bloggers. If you have taken rebirth for this purpose, you are going to be disappointed in this lifetime. If you persist in this task, you will have to be reborn many more times until you realize the futility of your venture. Again, you need to prove it by publishing the proof to convince mainstream scientists otherwise the remainder will be larger than the modulus. Please do not publish the proof as a comment to this blog. I REMEMBERED MY past lives. but that does not change my habits, characters and thinking. so there is no use of discussing such issues.